New Rogers Park Police Cmdr. Thomas Waldera addresses neighbors Monday at the Loyola Park field house. 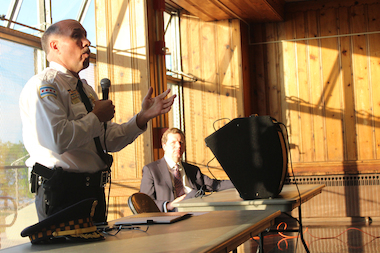 ROGERS PARK — New Rogers Park Police District Cmdr. Thomas Waldera, a 26-year veteran of the Chicago Police District, said he was "very, very familiar with the violence" in the neighborhood. Waldera commanded the Area North Gang Enforcement Unit from 2005 until he was promoted to district commander at the end of April to replace the beloved Cmdr. James Roussell, who had also been promoted. In the weeklong span between Roussell and Waldera, another commander, Terrence Williams, was briefly the district's top cop before being reassigned to the South Side. "I'm very, very familiar with the violence in the area," Waldera told a crowd at a meeting hosted by Ald. Joe Moore Monday night at the Loyola Park field house, 1230 W. Greenleaf Ave. In his years with gang enforcement, Waldera said he worked often in Rogers Park. Years ago, he was part of a successful mission to crack down on crime at the park surrounding Gale Elementary School on Howard Street. The park is now named after Olympic track star and social worker Willye B. White. The new commander said he deploys most of the district's resources to the Howard Street area and supports the social service organizations there, like the Howard Area Community Center and Family Matters. Waldera, like his predecessor, had been planning for the year's first warm weekend. Bike cops had already been deployed to the lakefront, he said. Waldera also praised the community's effort to revitalize Morse Avenue in recent years. "When I saw Morse Avenue, I couldn't believe it," he said of the street's lack of criminal behavior. Neighbors also praised police for improvements along Loyola Beach. Waldera said shootings were down more than 50 percent in the district as compared to last year — by this time last year there had been 19 shootings.